The cruiser ROYALIST commissioned at Plymouth in the United Kingdom on 17 May 1956. After undergoing trials, the ship sailed from the United Kingdom on 16 July 1956 for the Mediterranean to undergo a period of exercises with units of the Royal Navy. During this exercise period, the ship visited Marseilles and Naples. While at Naples, a representative party attended the unveiling by Lord Alexander of the Commonwealth War Memorial at Cassino. When the Suez crisis arose, ROYALIST was in the Mediterranean but was not committed to operations against Egypt. On 10 November 1956, the ship sailed for New Zealand by way of Freetown, Simonstown, Mauritius, Fremantle, and Hobart, arriving at Auckland on 20 December 1956. After giving leave to the ship’s company and undergoing a period of docking, ROYALIST sailed on 11 February 1957 for a cruise of New Zealand ports. Ports visited included Gisborne, Napier, Lyttelton, Timaru. Dunedin, Bluff, Picton, New Plymouth and Wellington. ROYALIST returned to Auckland on 21 March 1957. The cruiser ROYALIST re-commissioned at Auckland on 9 April 1957 and, after a period of self-maintenance and trials in the Auckland area, departed for Sydney on 20 May. After an intensive work-up and exercise programme in the Sydney-Jervis Bay area, the ship joined the Far East Fleet at Singapore on 18 July 1957 as New Zealand’s naval contribution to the Far East Strategic Reserve until 16 June 1958. One week after her arrival, ROYALIST carried out an action bombardment against possible terrorist positions inland from Tanjing Lamput. In late August 1957 a series of Fleet exercises were carried out in the Hong Kong area and the ship then proceeded via Singapore to Penang for the Merdeka celebrations in connection with the Malayan Proclamation of Independence. A 14-day self-maintenance period at Singapore followed before ROYALIST departed for Hong Kong, Japanese ports, and South Korea with other naval units of the Far East Station. Returning to Hong Kong in mid-November 1957, ROYALIST remained in that area for several weeks before proceeding to Singapore for self-refit and docking. On 20 February; 1958, a two-hour bombardment was carried out in an area to the west of Tanjong Punggai in south-east Johore believed to be occupied by Malayan terrorists. In late February ROYALIST took part in a series of large-scale concentration exercises with other units of the Far East Fleet. At the Singapore naval base on 3 March 1958, ROYALIST was visited by the Prime Minister, the Right Hon. Walter Nash, P.C., M.P. A further series of exercises in the Malayan area took place and the north-east Borneo ports of Sandakan and Jesselton were visited in late March 1958. In January 1959 ROYALIST, in the course of a short New Zealand cruise, visited Wellington, Lyttelton, Timaru, and Dunedin. During this cruise, the Minister of Defence, Hon. P. G. Connolly, D.S.C., V.R.D., M.P., took passage from Lyttelton to Timaru and Dunedin. After participating in the annual ceremony at Waitangi in early February the ship proceeded for a further period of service on the Far East Station and joined RAN and RN ships in an intensive exercise programme in Australian waters before arriving in Singapore on 26 March 1959. HMNZS ROYALIST has spent a busy and fruitful year, which began with two months spent on the Far East Station during which she took part in the SEATO exercise “Sea Demon”. On passage back to New Zealand a goodwill visit was made to Brisbane in connection with the Queensland Centenary celebrations. In July and August 1959, ROYALIST had the honour of carrying His Excellency the Governor-General and Lady Cobham on their Vice-Regal tour of island territories, during which the ship visited 15 islands in the Tonga, Friendly, Samoa, Cook, Tokelau, and Fiji groups. In November 1959 ROYALIST temporarily joined the Australian Fleet for a brief but extremely valuable period of exercises in New Zealand waters with HMA Ships MELBOURNE, VOYAGER, VAMPIRE, and HMNZS KANIERE. Captain H. D. Stevenson, RAN, took command in January 1960 under an exchange agreement, which heralds an era of even closer cooperation between the two navies. In February 1960 HMNZS ROYALIST attended the annual Treaty of Waitangi celebrations at Port Russell with HMNZ Ships ROTOITI and KANIERE, HMAS SWAN, and HM Submarine ANDREW in company. This was the largest number of ships of combined navies to be present for the Waitangi celebrations for some years. A naval guard and the band of the Royal Marines took part in the ceremony and the ships were illuminated at night. After a three-day exercise with these ships in the Hauraki Gulf, ROYALIST sailed for an exacting but popular and successful cruise of the major ports of New Zealand. From May to September 1960 HMNZS ROYALIST underwent a major refit in HMNZ Dockyard at Devonport, the first to be undertaken on such a scale since the ship completed modernisation in 1956. On 23 January 1961 the ship again sailed for Australian waters, this time en route for a six months tour of duty on the Far East Station as New Zealand’s contribution to the naval element of the Commonwealth Strategic Reserve. Her first assignment was to participate, with ships of the Royal Australian Navy, the Royal Ceylon Navy, the Royal Navy, and the Indian and Pakistan Navies, in the most ambitious combined exercise yet held in this annual series, known by the code name “JET ’61”. This was followed by highly successful flag showing visits to Madras in India, and Chittagong in Pakistan, on conclusion of which the ship arrived in Singapore on 27 March 1961. HMNZS ROYALIST sailed from Singapore on 19 April 1961 to take part in Exercise “Pony Express”. This exercise, which entailed an opposed landing on North West Borneo using British and American troops and equipment, was successful and showed once more the high degree of compatibility achieved by ships of the different navies. A cruise to Korea and Japan with units of the Royal Navy had been planned for May and June. Unfortunately, because of the unsettled political situation, the visit to Korea was cancelled but the ships were made welcome in Sasebo, Nagoya, and Yokohama. The ship sailed from Singapore on 8 July, being relieved on the Far East Station by HMNZS PUKAKI, and after calling at Darwin, Port Moresby, and Noumea arrived at Nukualofa on 31 July. His Excellency the Governor-General embarked at Nukualofa to carry out a Vice-Regal tour visiting Rarotonga, Mangaia, Mauke, Mitaro, and Atiu in the Lower Cook’s, Apia, and Pago Pago before disembarking at Suva on 17 August 1961. The ships arrived at Auckland on 22 August 1961 for docking, self-refit, and leave. On 23 October 1961, ROYALIST under the command of Commodore J. O’C. Ross, with HMNZS OTAGO in company sailed for exercises with the Australian Fleet. After a comprehensive series of anti-submarine and surface exercises the ships participated in the Royal Australian Navy’s fiftieth birthday celebrations in Melbourne. A combined force comprising HMNZ Ships ROYALIST, and OTAGO, HMA Ships ANZAC, VOYAGER, QUEENBOROUGH, YARRA, and PARAMATTA, HMS CAPRICE, and HM Submarines TRUMP and TAPIR, then departed for Auckland. Trans Tasman anti-submarine exercises were conducted during passage. The force arrived in Auckland on 25 November 1961 and, after participating in exercises (AUCKEX 6), maintenance and pre-refit trials were carried out before Christmas leave started on 14 December 1961. The refit of ROYALIST started on 15 January 1962 and is due to be completed on 13 April. After trials ROYALIST will be operational on 25 May 1962. HMNZS ROYALIST added to New Zealand naval history when the ship left Auckland for Pearl Harbour in June to undergo the first work up by an RNZN ship under the U.S. Navy system. A call was made en route at Apia where a four-gun saluting battery was presented to Western Samoa. On arrival at Pearl Harbour ROYALIST began a month of battle-training exercises with units of the U.S. Navy, during which all functions of the warship were tested. The experience proved so satisfactory as to raise hopes of repeating it with other RNZN ships. ROYALIST then sailed for Canada and the U.S.A. on the first extended cruise of the North American Pacific coast by a ship of the RNZN, and visited Victoria, B.C., Vancouver, Seattle, San Francisco, Long Beach, and San Diego, before returning to New Zealand in October. 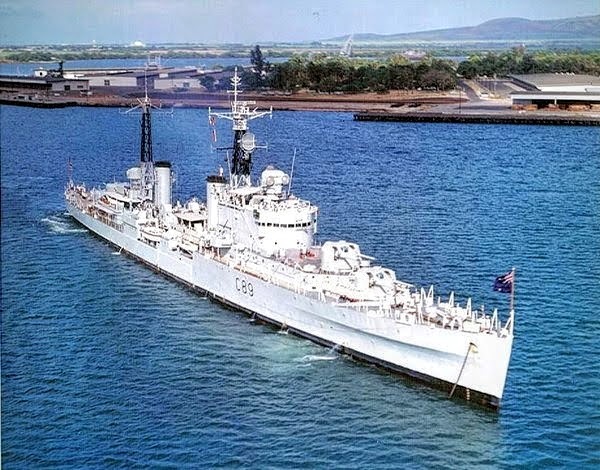 ROYALIST sailed again from Auckland in February 1962 to relieve HMNZS TARANAKI on the Far East Station, visiting Brisbane, Darwin, and Port Swettenham en route to Singapore. HMNZS ROYALIST, serving with the Far East Fleet, participated in exercise “SEA SERPENT’, described below. The ship also visited Hong Kong, Manila, Hakata, Kure and Tokyo before sailing from Singapore in June for return to New Zealand. Visits were made to Darwin and Townsville en route to Auckland. ROYALIST sailed from Auckland in August to participate in a joint exercise with Australian warships. Following her return from Sydney, ROYALIST began a New Zealand cruise and. visited Lyttelton, Picton. Nelson, and Napier before returning to Auckland in October 1963. ROYALIST visited the Bay of Islands in February 1964 to participate in the Waitangi Day celebrations and subsequently carried out exercises and gunnery practice in the Hauraki Gulf. HMNZS ROYALIST sailed in April 1964 from Auckland with the Governor-General, Lady Fergusson, and their party for a four-week tour of 17 southwest Pacific islands. The ship then proceeded to the Far East where she took part in exercise “LIGTAS” and visited Hong Kong, Bangkok, and Singapore before returning to New Zealand via Darwin and Brisbane in August. The ship then refitted at Auckland until November, and in March 1965 sailed for Pearl Harbour for refresher training with the U.S. Navy’s Fleet Training Group. Before relieving OTAGO in May 1965 as New Zealand’s contribution to the Commonwealth Strategic Reserve, the cruiser ROYALIST underwent refresher training at Pearl Harbour earning a final average grade for training of excellent and a pass mark of 90 per cent. While on the Far East station the ship made visits to Thailand and Japan. ROYALIST left Singapore for New Zealand on 21 October 1965. On 1 November 1965, in the Solomon Sea, serious salt contamination of the boilers forced the ship to come to a stop. Following assistance from HMS DAMPIER, ROYALIST was taken in tow by the Australian ocean-going tug CARLOCK and, shortly afterwards, HMNZS LACHLAN replenished her at sea with urgently needed supplies. By 12 November 1965 the crew had carried out sufficient repairs for ROYALIST to be able to slip the tow and complete the voyage home under her own power. ROYALIST arrived in Auckland on 17 November 1965 and has since been used alongside for training purposes. It is stated above that Royalist was not committed to operations against Egypt when the Suez Crisis broke out! Two years ago, Margaret A Snow did a Research Exercise in 2014 which was presented as part of her Bachelor of Arts Honours Degree in Humanities in History at Massey University. This showed that Royalist certainly took part in operations with the Mediterranean Fleet. Those of us who were in the crew at the time, certainly knew that the we were very much involved with the operations against Egypt. With the NZ government not even knowing where we were for much of the time, it is no wonder that the crew are not considered ‘veterans’. This is still a sore point that no-one in any position of power seems to want to address, even though we have been awarded the NZOSM and NZGSM (warlike) with Near East clasp. the front of the Bridge …it has NO Silver Ferns on it. I have changed the photo of ROYALIST which shows her as she was in 1965. This was taken off the Ammo dump opposite Ford Island, Pearl Harbor. Ships going into Pearl for a workup had to offload half of their ammunition before going alongside. Supposedly to lessen the effect should the ship blow up if attacked. In 1968, Endeavour went to San Francisco to pick up ammo for the NZ Army in Vietnam and we called into Pearl on the way back (Otago was in Pearl at the time). Our holds and fuel cargo tanks were full of ammo but we didn’t have to unload but they stuck us at the end of Pier Hotel on our own away from everyone else – just in case. Wot no mention of concrete in the bow to obviate damage done when Commodore Vallant wished to get back to Auckland for a Test Match or so it is said. That was 1962 and the CO on that occasion may have been Capt BE Turner. Vallant was was skipper in 1965. John..It wasn’t J P S “Cockroach” Vallant….it was Capt C C “Clueless “Clinton…. No disrespect to the said Gentlemen, but that is the nicknames they were known by. During the Merdeka ceremony, the last Union Jack was officially lowered by Yeoman Lyndsay Glassey, and I as a junior sig provided the tension on the other end of the halyard. That is if my memory is still accurate! Well done Chris P! We were there aye mate. By the way Frank you’re a month out with the Date of Commissioning. It was 17th April ’56. John,you are correct.Clueless was the Skipper and was determined to get back to Auckland via a ginormous storm in the Tasman.. It was quite a trip. Funny things on the trip were few and far between but the Sparkers Mess deck scuttle .blowwing in must count.The deadlight closure was the fastest operation in Naval History.The trip itself is a book in its own right,if ever written. Never went to San Diego in 62. Trip was cut short ! Yep, quite correct James. I was there, I think we did a boiler attempting to depart Long Beach and the repairs took over a week from memory so we missed out on San Diego. How good were the STAAGs? They were eventually replaced by Sea Cat in the frigates that followed. Most sources say they were unreliable due to so much electronics on the gun mount itself. Anyone know how much maintenance they took? I note that Taranaki and Otago used a Type 262 radar in their early Sea Cat directors, that were similar to the CRBFD and STAAG used to direct 40mm. Did this mean there was limited radar guidance of Sea Cat? Seems to me the STAAG might have been a better weapon for close range AA if the problems had been addressed, with some capability to engage crossing targets. Sea Cat appears to have had very limited success in combat, although it was a much lighter system. A STAAG mounting was close to 20 tons. Would be fascinating to know how the Type 262 was used to track targets. Was it automatic? Did the operator have to slew the weapon onto the radar target?